THE BEAST OF HOLLOW MOUNTAIN: A Cut-Price Vacation In Stop-Motion Valley – Schlockmania! There’s a good reason that Willis O’Brien and Ray Harryhausen were the kings of stop-motion effects in 20th century genre filmmaking: it’s both challenging and time-consuming to do this type of effect correctly and few filmmakers have the stamina or the budget to build an entire film around such effects. That said, the ’50s were an era when filmmakers would throw their hat in the O’Brien/Harryhausen ring, even if they cut corners in a way these men never would. 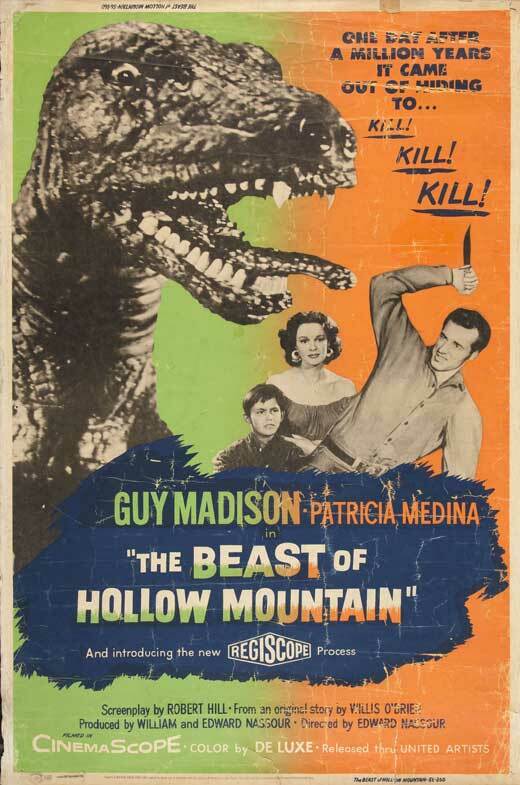 One of the more entertaining entries was The Beast Of Hollow Mountain, an offbeat blend of western and monster movie. In fact, The Beast Of Hollow Mountain is actually based on a Willis O’Brien story idea, even though he didn’t create any of its special effects. It starts off like a straightforward western. Jimmy Ryan (Guy Madison) is the square-jawed hero, an independent rancher trying to get a cattle ranch going in Mexico. Unfortunately, this puts him into conflict with well-to-do local Enrique (Eduardo Noriega), who is also a cattle rancher and doesn’t want competition. The situation is exacerbated by the fact that Jimmy has a flirtation going with Sarita (Patricia Medina), whom Enrique intends to marry. Enrique wants to buy Jimmy’s ranch but Jimmy is determined to successfully make a cattle sale. Enrique begins to resort to sabotage, starting small and growing bigger as Jimmy digs in his heels. However, the two find themselves dealing with a problem that is literally bigger than the both of them: the locals are superstitious about a demon that supposedly lives in nearby Hollow Mountain and the events of the finale conspire to force this legend out into the open. It turns out the demon is actually more prehistoric in nature and the third act throws out all the special effects stops as the town is forced to confront this giant-sized menace. The Beast Of Hollow Mountain is often criticized by genre fans for delaying all its stop-motion effects until the finale. However, the western tale that dominates the film’s first two acts is pretty entertaining. The cast is solid, with Western vet Madison making for a solid old-fashioned hero. The story might be full of familiar cowboy-flick elements but directors Edward Nassour and Ismael Rodriguez handle the storyline with style and energy: the pacing is trim, Jorge Stahl Jr.’s CinemaScope lensing beefs up the film’s production values and the mountainous Mexican locales make a visually arresting setting. The one rea l misstep in The Beast Of Hollow Mountain pops up during the finale: the stop-motion effects look pretty rough, particularly when compared to a Harryhausen project. The animation of the title creature has jerky, “stuttering” quality to its movement and there are some blurry, ragged-looking rear projection shots. However, the finale is still fun if you can forgive the subpar special effects: the ambitious climax combines a wedding, a cattle stampede and a final battle in the valley swamp. Simply put, The Beast Of Hollow Mountain is fun despite its problems. The quirky blend of genres actually works pretty well and the action is fun even when the stop-motion quality falls short. If the effects were better, this would probably be considered a minor classic of the form. As it is, it’s still plenty of fun for monster movie fans, especially if they also enjoy old-school westerns. 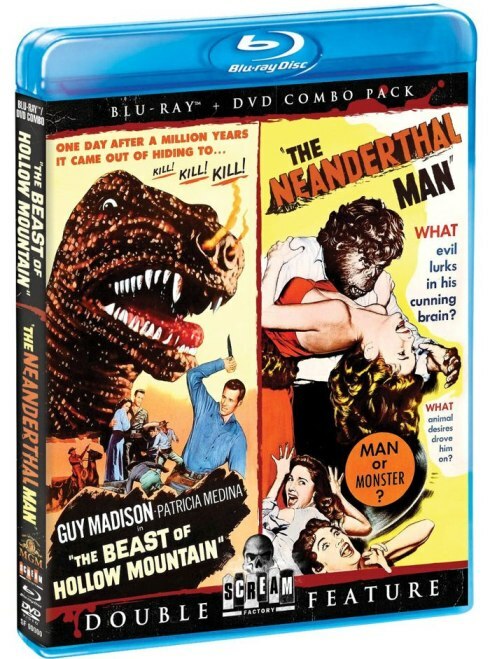 Blu-Ray Notes: This film was revived as half of a double-bill disc with The Neanderthal Man by Scream Factory, presented in a blu-ray/DVD combo pack. The blu-ray was viewed for this review. The source material shows some scratches around reel changes but looks pretty good overall, preserving the Cinemascope framing in style and offering nice levels of color and detail. The mono soundtrack is presented in lossless form and sounds nice for a vintage mix. There are no extras but there is a second film to enjoy and the viewer gets the choice of blu-ray or DVD formats.